I have always been a fan of Roger Zelazny. When I was a teenager, The Chronicles of Amber were a library book quest to find the whole set, which never quite happened, so it wasn’t until later in adult life that I was able to purchase the bumper edition that contained them all. Doorways in the Sand was first published in hardback and paperback in 1976, the year I was born after being serialised in Analogue magazine. It has now been republished by Farrago, and the new edition revives a timeless story about time. It tells the story of Fred Cassidy a perennial student at Oxford University whose daily struggle is to maintain his non-graduated status and therefore his inherited trust fund, in the face of his tutors attempts to award him some kind of degree. When an alien transporter device is discovered in the room he shared with another student, Hal Sidmore, Cassidy’s life is turned, quite literally, upside down. Zelazny’s writing is a fast-paced maelstrom, focused on the plot. Events whirl past in a in a page turning blur. The Amber series unpacks like this, as a multiplicity of realities are linked together with characters of the same name reoccurring with strange links to their previous incarnations. There is a downside. When you do put the books down, the story is difficult to reconnect with. Despite this, the scene setting of Cassidy’s circumstances in Oxford University is strangely timeless, which either infers something about Zelazny’s writing, or says something about the parochial nature of the institution. In Doorways, the issue of frenetic pace is exacerbated by the manipulation of time and the strange order of memories in Fred’s mind. Many of the chapters begin half way through, running backwards to the beginning and forwards to the end. The link of two parallel worlds in strange ways that allow the timelines to influence each other, creates a confusing tapestry of events, much like the way in which the film Memento (2000) is structured to convey the experience of the protagonist, Leonard, who has no long-term memory. In Doorways, Fred’s experience of events is jumbled by his transference between places, but as the first-person narrator of the story, he is the main sense maker for the reader, so this juxtaposition creates a heady and jarring reading experience of contrast, particularly when allied with Zelazny’s trademark swirl of events. How the writer is able to maintain their own understanding of what is going on and establish a strange, fantastic consistency of how this altered world works is beyond the reader experience at times. But you always have a sense that Zelazny knows what he is doing and remains a couple of steps ahead of you at each turn. The use of the alien artefact to transfer between worlds is a particularly interesting moment and another opportunity to invoke the strangeness of Cassidy’s experiences. There is something akin to Mieville’s, The City & the City (2009) when Inspector Tyador Borlú transfers between worlds and the writer manages to convey a sense of dislocation and occasional distress. Gradually, the premise of Doorways is revealed and so too, through this is its absurdity. Conversely, Zelazny takes his time in getting to the explanation of what is going on and what has to happen, but by the time he does, the gentle humour of the writing and witty wordplay has thoroughly infected you. Yes, this is a silly idea, but then there’s quite a lot of silliness and sarcasm which never strays too far from the hectic rush of events and developing rationalisation of this strange world. The book is stuffed full of ideas, references, cleverness and entertainment. A re-read means you discover more that might have passed you by and any discussion or examination of the writing has to involve admiration for the execution of this strange, light hearted and humorous book. 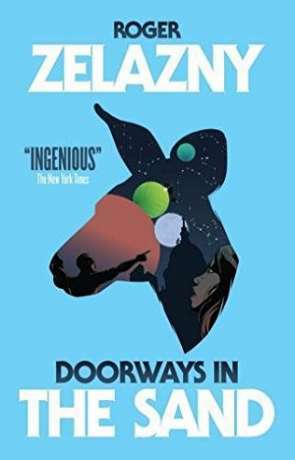 Doorways in the Sand is a joy to discover or re-discover and remains a timeless classic example of Zelazny’s swirling prose. It was nonimated for both the Hugo and the Nebula Awards. Its a treat to see it republished now. Written on 2nd November 2017 by Allen Stroud.